The first ever gay Muslim wedding has taken place in the United Kingdom. Twenty-four-year-old Jahed Choudhury and 19-year-old Sean Rogan tied the knot in Walsall registry office in traditional Muslim attire. Adding that Sean gave him hope at his lowest point and has stood by him ever since. Choudhury said that being an openly-gay Muslim made him feel like something of a ‘black sheep’ and that he ‘stood out like a sore thumb’ and often felt trapped between his sexuality and faith. He tried to deny his orientation and even tried taking medication and a pilgrimage to Saudi Arabia and Bangladesh. 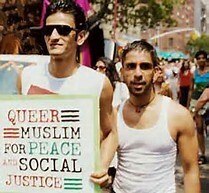 Although his family were’t present for the ceremony, Choudhury believes the wedding is significant progress for the Muslim and LGBT communities alike. He added: “My family doesn’t want to come on the day, they just don’t want to see it, it’s too embarrassing for them.” Choudhury says that some of his family members dismiss his sexuality and happy relationship with Sean as a ‘disease’ or a phase.